Following up with my last post, this is the front of the mansion attached to the entrance. Funded by a local wealthy businessman, Mr. William Bourn, construction of the home began in 1915 and he and his family moved in two years later. "FIght for a just cause; LOve your fellow man; LIve a good life." If the house looks a little familiar to you, it has been featured in a number of television shows and movies. I first noticed it from the opening credits of the 1980's show "Dynasty". You can see the home as the camera pans over it 15 seconds into the video I found on Youtube. In the show, the home was portrayed to be in Denver, Colorado, but in actuality, it is only about 30 miles south of San Francisco. More beautiful flowers and possibly a former fountain at the front entrance. De biens jolies tulipes rouges. Dans mon jardin , en Picardie,elles sont également en pleine floraison, si tu veux aller faire un tour sur mon blog il y a pas mal de créations et de nouvelles photos. Une bonne journée. Amicalement. 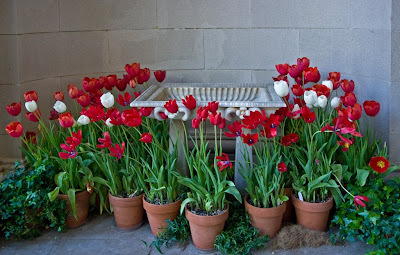 In real pretty red tulips. In my garden, Picardy, they are also in full bloom, if you want to take a look at my blog there are a lot of original and new photos. A good day. Regards. The Filoli acronym is beautiful and meaningful. Not only was he a man with tremendous wealth but also a man of great principal and compassion. Do you know if anyone still live there? Christian: Tulips are my favorite flowers. Thank you for sending me the link to your other blog. RoseBelle: The last owner donated the house & garden to the National Trust For Historic Preservation and now it's open to the public. The name of the house is interesting. And it's always fun to see a house like this that was from a famous TV show. 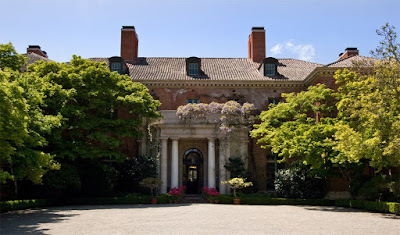 what a charming setting of the mansion and Filoli is such a lovely name. "AVCR8TEUR's Photo Blog" has been included in this weeks A Sunday Drive. I hope this helps to attract even more new visitors here. I am now in love with Filoli. I like the way he named the place. Beautiful mansion and love the name. I immediately recognized it when you mentioned Dynasty.